James Dietz Handsigned and Numbered Limited Edition Print:"Downed Bird"
About the Art: In Downed Bird, Dietz reminds us of the irony of war. 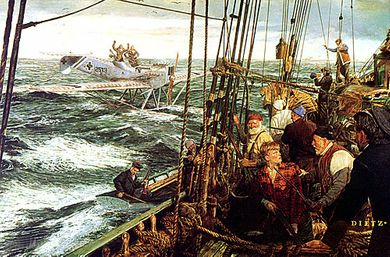 The "Brandenburg W29," the finest German floatplane, surrenders to a French sailing vessel. In his attempt to sink the ship, he was shot down himself, and the aircrew now finds itself at the mercy of the sailors on board.